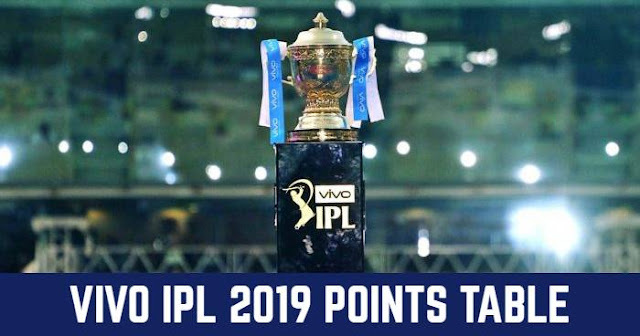 Kings XI Punjab (KXIP) will take on Mumbai Indians (MI) in the 9th match of the 12th season of Indian Premier League (IPL 2019) on 30 March 2019 at IS Bindra Stadium, Mohali. As far as weather is concerned, it will be unseasonably hot in the afternoon with the temperature at 36°C. Being the day match no dew factor. The Mohali pitch will be nice and flat. And with heat baking it down, expect it to be hard, meaning it'll enable stroke-play. Kings XI Punjab are coming with a loss after winning their first match. On the other hand, Mumbai Indians won their last match after losing their opening match. Kings XI Punjab is missing their sixth bowler; Moises Henriques staying back in Australia to participate in the Sheffield Shield final. Apart from that, Hardus Viljoen can be replaced by Mujeeb Ur Rahman and Varun Chakravarthy can be replaced with Ankit Rajpoot. Mumbai Indians looks strong and will continue their same playing XI against Royal Challengers Bangalore. Mumbai Indians (MI) and Kings XI Punjab (KXIP) have played 22 matches against each other in Indian Premier League (IPL); out of which both Kings XI Punjab have won 10 matches and Mumbai Indians have won 12 matches. In last 5 matches played between Mumbai Indians and Kings XI Punjab, Mumbai Indians have won 3 matches and Kings XI Punjab have won 2 matches. Mumbai Indians won both matches in IPL 2018. 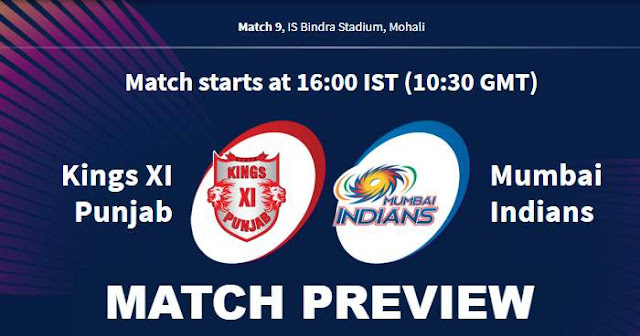 Kings XI Punjab and Mumbai Indians have played 7 matches against each other at IS Bindra Stadium, Mohali; out of which first 3 matches are won by Kings XI Punjab and later 4 are won by Mumbai Indians. Kings XI Punjab won all three matches they played at the IS Bindra Stadium in VIVO IPL 2018. Mumbai Indians have won their last four matches at the IS Bindra Stadium; the last time they lost a match at the venue was in 2011. Hardik Pandya’s economy rate in his last 13 T20 matches stands at 9.88. In matches prior to that, his economy rate was 7.79. Probable Playing XI for KXIP: Ravichandran Ashwin (c), Lokesh Rahul (wk), Chris Gayle, Mayank Agarwal, Sarfaraz Khan, David Miller, Mandeep Singh, Mujeeb Ur Rahman, Murugan Ashwin, Mohammed Shami, Andrew Tye. Probable Playing XI for MI: Rohit Sharma(c), Quinton de Kock(w), Suryakumar Yadav, Yuvraj Singh, Kieron Pollard, Hardik Pandya, Krunal Pandya, Mitchell McClenaghan, Lasith Malinga, Mayank Markande, Jasprit Bumrah.